Blue-Green: water with a low pH less than 7 can be acidic and corrosive. Metal ions, such as iron, manganese, copper, lead and zinc can leach from the aquifer, plumbing fixtures and piping causing premature damage to metal piping, staining of laundry, sinks and drains, causing a metallic taste and even color changes to human hair. This requires neutralization. Red/Black/Orange/Brown/Yellow: Iron and manganese are the two most common metallic elements found in the earth’s crust. Water percolating through soil and rock can dissolve minerals and hold them in solution. They leave orange, yellow and dark grey stains on everything they touch, most noticeably on white surfaces such as sinks, tubs, showers, toilets and especially white clothing. Iron and manganese are by far the toughest of all minerals to get rid of from well water supplies and the solution needs to be diagnosed properly. When iron exists along with certain kinds of bacteria, the bacteria consumes iron to survive and can leave a reddish brown or yellow slime that can clog plumbing and cause slime, sludge and an offensive odor. Yellow: Tannins are formed from decomposing vegetation and can cause a yellow to brown (sometimes pinkish) color in water and may also impart a bitter taste and odor. They can be difficult to remove from water and the treatment must be customized for each individual situation. 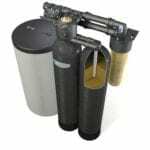 It is usually recommended that the water be treated by a softener prior to the tannin removal unit.